Fiberglass cloth laminated with aluminium foil (AL) is one of Plastech Marketing’s most popular products for thermal applications e.g. car/forklift engines, air conditioning ducts, packaging, battery pouch, etc. 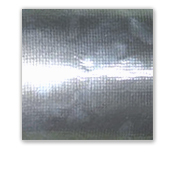 Aluminum Foil Thickness : 0.035mm. Glass Cloth Thickness : 0.80mm.